Tool AA is another impressive work after Tool AAA. 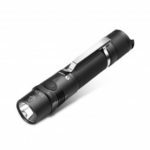 With the incredible handy and compact size, it emits a max output up to 550 lumens with the compatibility with one 14500 rechargeable Li-ion battery. Three output levels for various lighting demands. There are two tail versions for option, tail switch and magnetic, capable of tail standings to serve as a candle or magnetic suctions on metal surface for different position lightings. Two positions body clip offers various wearing manners, such as clip on your pocket or on a cap to free your hands. 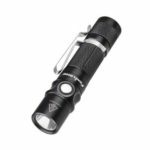 Tool AA is essential for hiking, camping, touring, home using, gifts, EDC gears, and emergency lightings. 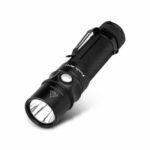 Utilizes Cree XP-L HD LED with a lifespan of 50,000 hours. 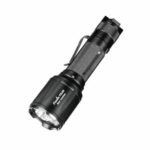 3 output levels with a max 550 lumens. 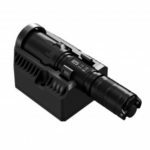 Powered by one AA or one 14500 rechargeable Li-ion battery (sold separately). Only 91.6mm in length, 23.5g in weight, handy and compact, easy to carry (19.5mm and 22.5g for magnetic tail version). Detachable body clip for two position installation, easy to clip on your pocket or a hat. Two ways to select outputs: Tail switching or twist the head. Switch and magnetic tail cap for options, magnetic tail version is capable of tail standing. Made of aircraft-grade aluminum alloy with anti-scratching type HAIII military grade hard-anodized finish. Double-side AR coated, tempered window resists impact and thermal shock, max 99% light transmission. Waterproof to IPX8 standard (2 meters submersible). 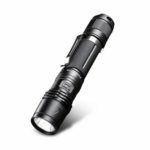 Scope of applications: hiking, camping, camping, touring, home using, gifts, EDC gears, and emergency lightings.